Israeli soldiers abducted, on Sunday evening, a Palestinian man from Hebron, in the southern part of the occupied West Bank, and stopping him at the Container Roadblock, north of Bethlehem, and opened fire at a car in Hebron. Media sources said the soldiers, stationed at the Container military roadblock, north of Bethlehem, stopped and searched dozens of cars, and abducted Nader Abdul-Hafeth Abu Mayyala, from Hebron city. The sources added that the soldiers cuffed and blindfolded Abu Mayyala, and took him to an unknown destination. Furthermore, the soldiers installed a sudden military roadblock at the northern entrance of Hebron city, and opened fire at a Palestinian car that was apparently unaware of the checkpoint. 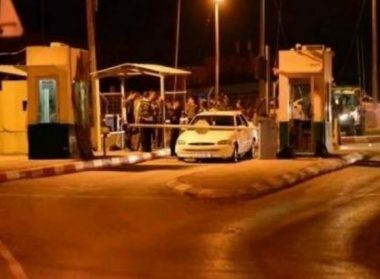 The soldiers closed the road and initiated searches of many vehicles, in addition to inspecting the ID cards of the Palestinians while interrogated many of them.